DESCRIPTION AKA The Blue Triangle. It has an attractive blue band on upper and lower wings. 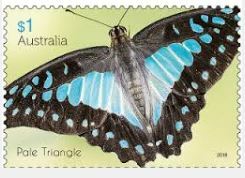 Found from the tip of Queensland through to the mid NSW coast this common butterfly can be seen in most gardens where the introduced Camphor laurel grows. It is named after Sarpedon the King of Lycia from Ancient Greek Mythology. One of our best sellers.